The Zimmer Children's Museum on Museum Row on the Miracle Mile is the only dedicated children's museum in the City of Los Angeles. It features hands-on exhibits for children up to age 8 that use the landmarks and diversity of Los Angeles to teach big ideas. There are also scheduled music, story and art activities daily. Kidspace Museum in Pasadena is another great children's museum, with an abundance of indoor and outdoor activities to keep even the littlest kids engaged. 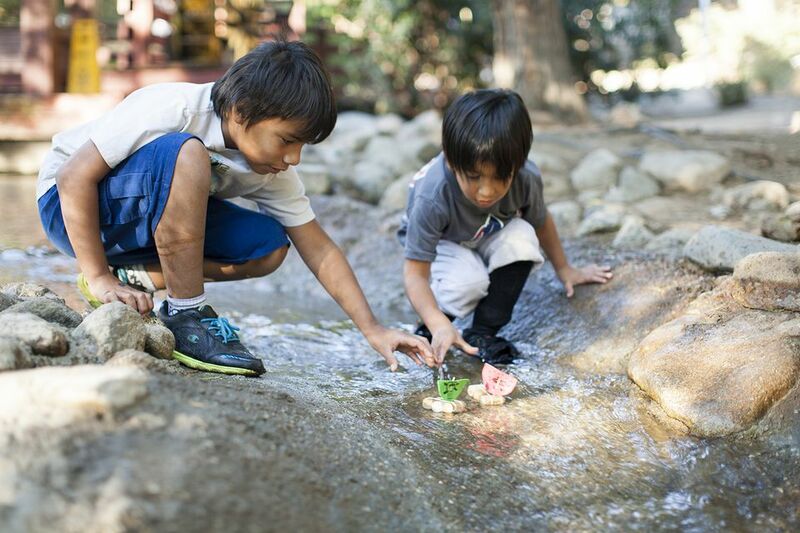 Climbing, exploring, examining, excavating and building can keep kids busy for hours. Pretend City in Irvine is set up like a small town with play areas representing all the functions of a city from the supermarket to the police station and the hospital. Kids can dress up and take on as many roles as they please. The California Science Center in Exposition Park is the top museum in LA for kids 5 and up, not only because of their exceptional hands-on exhibits that translate science concepts for young audiences but also because it's huge and free. The California Science Center is home to the space shuttle Endeavour, and also has an IMAX theatre that shows films related to exhibits. The Endeavour and IMAX have an admission charge. In addition to being an amazing feat of engineering, the Noah's Ark exhibit at the Skirball Cultural Center is just plain fun for kids of all ages to climb around and crawl through. The Discovery Cube with the giant cube on the roof is operated by the Discovery Science Foundation. It has over 100 interactive science exhibits designed to give kids an understanding of scientific concepts. In 2014, The Discovery Science Foundation opened a Los Angeles campus in the San Fernando Valley at the very north of LA. The Discovery Cube LA has state of the art exhibits on Space, Geology, Water and Power, Sanitation, and the Science of Hockey, among many others. Bowers Kidseum, a block down from the main Bowers Museum in Santa Ana, has temporary cultural exhibits designed especially for kids and lots of interactive programs. The main museum also has outdoor cultural family festivals on the first Sunday of the month. On the way to becoming a grand museum of SoCal culture for kids, the Southern California Children's Museum has found a temporary home in Pasadena and is open for fun. The Los Angeles County Museum of Art offers a variety of programs for kids and families. The Arts for NextGen program offers free museum membership and admission to anyone 17 and under and one accompanying adult. The Boone Children's Gallery in the Hammer Building offers families opportunities to see and make art together. Check their calendar for Free Family Sundays. The Getty Center also has a special family room where you can learn and play with your kids through a number of art-related exhibits. They also offer scheduled art activities for kids throughout the summer, garden concerts and family festivals. In addition to the scheduled programs at LA's major art museums, Quick Culture Tours offers engaging kids-only tours of LACMA and the Getty Center.